In hand embroidery, there are nearly endless fabrics you can use to stitch on. Once you’ve chosen one, however, you’ll need to prepare it. Cut your fabric to be as large as the final product, plus two inches for hemming. 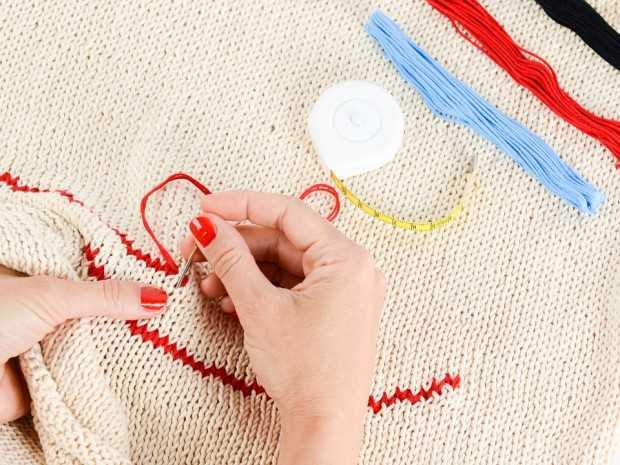 Make a few quick stitches (by hand or using a sewing machine) to the edges to make sure they don’t fray. If you’re creating something that will be washed in the future (say, a shirt or a table runner), wash and dry your fabric to pre-shrink it. If you’re just creating something for display, skip this step. Iron your fabric, and you’re ready to go. The most common way to start your threading is by tying a waste knot. Start by putting a small knot at the end of your thread. Then, choose a spot about an inch or so down from where you’re going to begin stitching. With your work facing up, push your needle down into the fabric. Make your stitch, then turn your work over. Cross over that thread that’s across the back of the line you’re stitching in order to couch the thread down. You’ll want to do this each time you come up to the front of your work. When you get to within a stitch of your original knot, pull the tail of the thread up and cut right below the knot. You should have a secure, couched line on the back of your work. Ending your thread is quite simple. Once you’ve completed your last stitch, turn your work over and run your needle under two or three already-made stitches. Then, run your needle again (but in the opposite direction) under the same two or three stitches to secure the thread even more. This is considered your anchor. After that, you can cut your thread and it should stay in place. The cross-stitch is perhaps the most common stitch in hand embroidery. You’ll be creating an “x” in your fabric, so with your work facing up, bring your needle up through one hole. Bring it back down through the hole diagonally across from it to create a diagonal stitch. Then, bring your needle up through the hole directly under the one you just went through and back down through the hole diagonally across from it. You should have a small “x” stitch. There are many different knots that you can create in hand embroidery, but we’ll explain the easiest one. For this knot, have your work facing up and bring your needle up through a hole. Pull the thread tight, then wrap your needle around it once. Push the needle back down through the same stitch, and you should have a small knot. You can do this again to the same stitch to make the knot larger, if you’d like. To stitch a straight line, start with your work facing up. Then, bring your needle up through one of the holes and back down through the hole next to it. Continue this until your line is as long as you’d like it. Then, bring your needle up through the first hole of the last stitch you created. Working in the opposite direction, bring your needle back down through the hole next to it. This should fill in the small gap between the stitches you just created. Once you get back to the beginning, you should have a straight line with no gaps. The chain stitch can be used to make anything from flowers to leaves to simple designs and more. With your work facing up, bring your needle up through the fabric. Then, bring your needle back down as close to your initial stitch as possible, but don’t pull it through all the way. This should create a loop. Bring your needle back up a short distance away and pass it through the loop you created. This should create the first link in your chain. Continue along until you have a chain stitch. This entry was posted in DIY and tagged crafts, embroidery, needlepoint, thread.